The breathtaking view, low cost, and easy access to town made this stay for our family of six unforgettable. 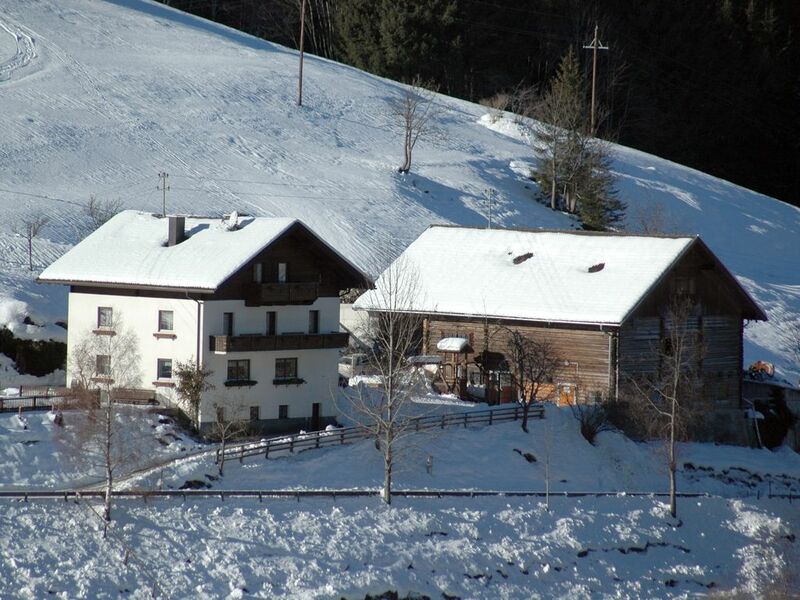 We had the entire top floor to ourselves with full kitchen, balcony overlooking the valley and Alps (where a cup of coffee or glass of wine was usually had), our own bathroom, and beautifully and simply appointed bedrooms. While the inside was very clean and mostly hand crafted, the hills and surrounding areas (ski towns, alpine villages, shopping, swimming, castles, hiking, biking, rafting, etc) really added to this mountain retreat. The house is family owned and operated (a 4th generation also lives there now) and while they grow and cut a lot of hay, they also have a hobby farm which the kids helped with each morning- goats, chickens, and rabbits. The family also has homemade items (jam, knitted wares, etc) for sale if you are looking for things like that. They also offer a breakfast each morning, if you want, for extra $. We did the homemade b-fast the first morning and, while it was super fresh and delicious, we were a family of 6 and so we went to the nearby grocery and got breakfast and lunch food for the remaining time and then went to Forstau or other nearby towns for dinner. The people in the town of Forstau were terrific and there is even an tourism information booth in town (which is about a 5 minute drive down the hill...and they speak English) to help you in exploring different activities if you are undecided. The scenic drive for us was about an hour past Salzburg and after touring Munich and Salzburg each for a few days, the rural setting was nice finish to our family vacation. I highly recommend this house, this family, and the town for an economic Austrian retreat where you really feel like one of the family. Can't wait to see anyone else's response and feedback. Es ist ein sehr uhriger, schöner, ruhiger Bauernhof. Alles war sehr sauber. Die Familie war mehr als herzlich und freundlich. Es war in allem ein wunderschöner Aufenthalt. Vielen Dank für die spitzen Bewertung! Hyggelig feriebolig i landlige omgivelser. Sehr sauber, ruhig und urig, die Kinder liebten ihr "Kämmerchen"
Leider war das Wetter nicht so toll, um so mehr haben wir uns über den Tipp mit der tollen Aussicht auf dem Rossbrand gefreut, das war wirklich einmalig. So wie sie selbstgemachte Erdbeermarmelade! Vielen Dank für die herzliche Bewertung! Es freut uns sehr das Euer Aufenthalt so angenehm war und wir freuen uns jederzeit über einen Besuch von Euch! Gerne würde ich noch wissen wofür wir den einen Stern Abzug bekommen haben? Wir hatten in Februar 2018 een sehr shönes Ferien gehabt bij Frau Rettensteiner mit 8 Personen. Das aufenthalt was einfach gut! Das Skigebiet ist nah (ca 10 Minuten fahren). Die Umgebung van Bauernhof is sehr ruhig und wunderbar. Wir hatten eine sehr gute Ferien, es ist herrlich ruhig und die Kinder haben sehr viel spass gehabt mit füttern von alle Tieren. Wir haben ganz gut geschlafen, alles war sehr sauber und sehr gemütlich. Die Familien Rettensteiner sind ganz lieb und keine Frage ist zu viel. In der nähe gibt es auch eine kleine Wasserfall, meine Kinder waren jeden Tag dort und mit viel vergnügen. Also wir haten eine super Ferien !